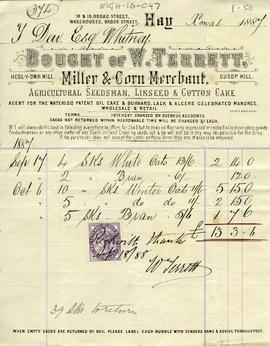 Account for oats and bran supplied in September and October 1887 by W.Terrett, Miller and Corn Merchant, Heol-y-dwr Mill and Cusop Mill, 18 and 19 Broad Street, Hay to T. Dew Esq, Whitney. Account settled 18 September 1888. The tail stones have been dismantled for dressing. 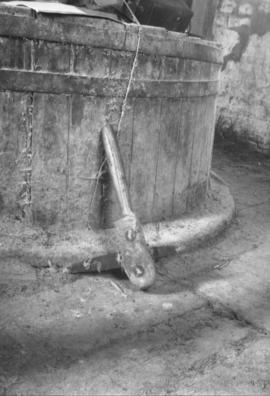 Also shown is a wooden millstone tramstaff and a mill bill and pick. Showing pair of stones with runner removed for dressing; note mill bills. Print no. 34A. French Burr runner stone raised. Mill Bill with spare bit or 'fusil'. Part of Billings' unpublished manuscript. Photograph of a man dressing a millstone, taken from W. Coles Finch's "Watermills and Windmills"
A stone-dresser at work: note the" lands and furrows"